Who Can You Trust in Brooklyn Heights Library Sale? 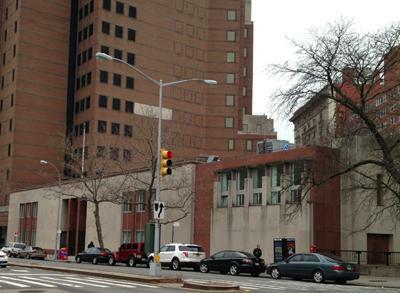 The Brooklyn Public Library’s controversial plan to sell its Brooklyn Heights library branch site begs the question: who best represents the community’s interest in this project? According to BPL senior leadership, the intent is to sell the Cadman Plaza site to a developer who will build a 40-plus-story tower housing a new library while providing for an interim facility during construction. The proposal is of intense local interest, entailing as it does the demolition of the current library, which some consider a local—albeit not designated—landmark, and the addition of another skyscraper to the Brooklyn Heights streetscape. Besides BPL, the most influential player in determining the library’s fate may be Brooklyn Borough President Eric Adams. The newly elected Beep, who during his campaign vowed to oppose any sale of library properties, says that his primary concern is the condition of BPL finances. Driving the proposed sale, BPL claims, is a whopping $300 million in deferred capital repairs, including $82 million in immediate needs. With private donations averaging only $5 million annually, according to the Library, capital funds must come either from selling off assets or from the budgets of public officials. The BPL, however, has no present plans to lay claim to the CPL funds. Lucy Koteen, a member of the Borough President’s library task force, disputes the BPL’s arithmetic. Another public body pondering the library’s fate is a Community Advisory Committee created by BPL prior to making its plans public. According to Nachowitz, not only is the CAC transparent, it has helped shape the proposal. Michael White—head of CDL and a tireless critic of the planned sale—professes no faith in either the CAC or the BPL. A member of the Borough President’s library task force, White has not been included in CAC discussions despite his extensive advocacy about the issue. Due to its support of the Cadman Plaza branch sale, the Brooklyn Heights Association’s likewise suffers White’s wrath. But BHA president Alexandra Bowie remains steadfast about her organization’s role in representing the Brooklyn Heights community. “At this point, the BHA’s position is what it has been throughout: the BHA does not know if the project is going to move forward, but if it does we want a working branch of adequate size for the nearly 290,000 checkouts each year, with interim service during any period of construction, inside a building that is well designed and is a gateway to the neighborhood,” said Ms. Bowie by email. A well designed building that is a gateway to the neighborhood can be achieved through redesign and upgrading. No doubt we need a newly designed library with room for all including seniors and children but we do not have to destroy the building and move the business library to central stacks to accomplish this. That library has always been a dump, working air conditioning or no. Well-designed new skyscraper with a brilliant new BPL facility, plus additional funds to BPL, seems smart. Otherwise, sell the real estate and move it into the lovely new 40-story tower coming to fund Brooklyn Bridge Park. We cant remain the same forever — we have to evolve. We have to build more roads, we need more housing, we need an imporved transit system, we need more garages… We cant just say “dont have a car in New York.” We cant just say, “build in other hoods.” We must grow to remain a city of the future. It’s exciting! This is New York. We should want the best and most modern — be ahead of our time… Not just complain about progress… We must be courageous and embrace change. Condominium Regime benefits the Real Estate Developers. a Condominium Regime we will have maintenance fees based on footage plus unlimited assessment charges, that will bleed the BPL dry. In contrast to the condominium regime, you may own real estate by FEE SIMPLE. FEE SIMPLE OWNERSHIP is the highest form of ownership, absolute and unqualified legal title to real property, including both buildings and land. This is the most commonly used type of ownership. You don’t necessarily refer to condominium ownership as fee simple since a unit owner does not own the land on which the building is constructed. That is owned in common with all of the other Unit owners. Condominium Regime benefits the Real Estate Developers. There are maintenance charges for condominiums which is the unit owner’s share of maintaining the areas of the building that are owned in common with all of the unit owners. A special assessment would typically refer to a special charge in addition to the maintenance charge to cover the cost of a project that is not necessarily part of routine maintenance. You can have fee simple ownership of a house in a subdivision, townhouse, etc. where you also have assessments to maintain the areas you share in common with all of the owners in the development, for example, a clubhouse, pool, roads, etc. Wow! Lucy Koteen, Michael White and Marsha Rimler are all on the borough president’s task force? That’s quite a coup! Anyone else? Norman Oder used to write for LJ—he must have some terrific insights. Do you even live here? “We need more garages”? “We have to build more roads”? Really??? Google “Landmarks Preservation Commission”. Have you been to Cadman Plaza lately?? Its nothing but highrises and has been nothing but highrises for 50 years. Face it…NYC is growing and the best places to accomodate that growth are in transit rich neigborhoods like ours. Nobody is talking about bulldozing the historic district. This property is outside the historic zone on a wide street lined with massive highrises. You people are the worst kind of NIMBYs….rich, white, “I got my piece of the pie now screw everyone else” NIMBYs. I’ll ask the same question that you never answer….how, exactly, to pay for this spectacular renovation (along with all the rest of the improvements we need….better parks,new schools, rebuilt roads and sewers, libraries in OTHER neighborhoods, etc)? More public money….and you don’t think other worthy causes (schools, hospitals, affordable housing, parks, roads, airports, ports, OTHER LIBRARIES, etc) are also asking for money from teh City, State and Federal governments? where will it all come from? The magical money tree? Even higher taxes? Taking money away from some other worthy project? Or more realistically taking money from a project in a poor neighborhood without people like you and DD White who clearly have the wealth to devote time to advocating for your disproportionate share of the pie? And bonds? Just go deeper and deeper into debt? Do you know how crushing NYC’s debt burden already is? Are you suggesting the library go into debt also? Seems like short sighted, limited thinking….just kick the can down the road and let someone else deal with the true costs because people in Brooklyn Heights don’t want more people cueing for tables at Noodle Pudding. Doesnt seem to creative to me. New construction can include garages. And yes, of course we need more roads… And I am not talking just about Brooklyn Heights. All around the City. There is absolutely nothing creative or out of the box about that thinking. That is age old financing not to mention pie in the sky. The money isn’t there and I doubt that the govn’t would approve the bonds. Thank you! Esp for the Family Court reference – thoughtful re-design vs cookie-cutter luxury. More garages?? Really???? This is not exciting! – New York works as well as it works because we are densely packed city not friendly to single drivers in cars …most of us commute via foot or public transportation, from 20 blocks away or (for example) Westchester. More exciting than a 35-story luxury condo is a thoughtful re-design of what the city owns (see Bankruptcy Court across Cadman Plaza in the PO Building) There’s plenty of luxury housing on Montague Street, and more going up on Remsen – enough! Yes, stop the stereotyping and hatred you outdated right wing fascist. * the $40 million to build a full scale replacement library. * the public cost of any and all disruption, lack of library services and rent for temporary replacement arrangements. * If our growing city should be growing, not shrinking, its libraries (as we at Citizens Defending Libraries believe) then you must also factor in the loss of the rights the library will one day need to expand the system. Meanwhile, we should probably, even now, be netting out the loss of books and music scores, etc. at the Grand Army Plaza library as they prepare for this shrinkage and library sale. The BPL is soon planning to greatly shrink its collections in the History, Biography and Religion section against the advise of the librarians working there. Lastly, that’s just the net (possible loss) to the city and the public. The net funds for the library system (as distinct from the city and the public) could be a lot smaller, if any (or the actual loss a lot greater) as the city, in a final analysis, intercepts funds from the sale. Can’t trust: The BPL, which tried to foist a fait accompli on the public without any open discussion. Can’t trust: Eric Adams, who promised to oppose this wet kiss to developers when he had an opponent in the race but has since gone wobbly. Can’t trust: Steve Levin, who came around on this issue when he saw all those votes out there but suddenly can’t find the courage to say NO. Can’t trust: The so-called Friends of the library or the BHA or any other social club that exists for its own self-gratification and has no interest in the public. So who can we trust? Ourselves. We the people must stand up in defense of our public assets and declare to the politicians, the developers and their sycophants that the library is NOT FOR SALE. The above article is helpful in bringing forth some of the voices in the conversation about the library. What is not covered is how this fight is connected to larger struggles. We see how hard the BPL is fighting for selling libraries starting with those closest to Ratner properties. (Ratner owns air rights above the Brooklyn Heights Library and the building next door, Pacific Library is next to the Atlantic Yards and just meters from the Ratner/Prokhorov “Barclays” arena). The sale of the Brooklyn Heights library is the beginning not the end of library sales, it is not the solution to the budget problem, it is the opening of a flood gate of library sales in Brooklyn. 1.) The fact (expressed in my quote appearing earlier) that the BHA previously said that it would follow the lead of the Friends Group which, in turn, has said it is absolutely unable to negotiate on behalf of the community. 2.) As apparent evidence that the BHA is, in fact, pursuing such a course of abject NON-negotiation, the BHA has never been witnessed “negotiating” anything at any CAC meeting (where Ms. Bowie has always been the individual present representing the BHA). Ergo: it would seem that her remark (a canned exhumation of previous stale and misleading remarks) has to be understood to be flat out disingenuous. If anyone doubts this let’s see where and when the BHA ever finally says (it should give specifics) that it will break ranks and disagree with that Friends group that has pronounced itself unable to negotiate in any respect on behalf of the community. How original. That’s your idea of “out of the box thinking”?